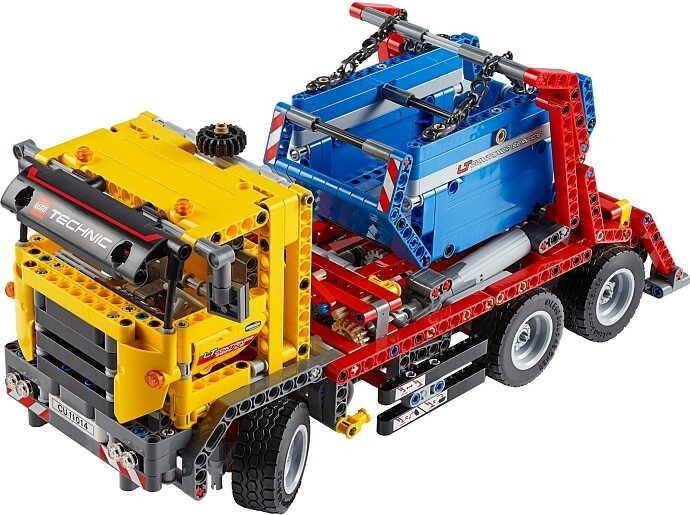 LEGO’s 42024 Technic Container Truck set received a fairly average review from our experts earlier in the year. Plenty of scope for improvement then. One builder to give improving the model a go is TLCB debutant Henry Quarmby, who has repurposed the pieces found within the official set for his excellent truck and trailer combo. Featuring working steering, a linear-actuator operated load bed, a working crane, plus a tilting cab with opening doors, Henry’s 42024 alternative has play value galore. The trailer doesn’t miss out either, with a folding jockey wheel and an opening cover. All the photos of Henry’s 42024 ‘C-Model’ can be found on MOCpages, plus you can read the aforementioned review of the original Technic Container Truck (or Skip Lorry as decreed by our reviewer) set by clicking on the link above. Which model do you prefer? 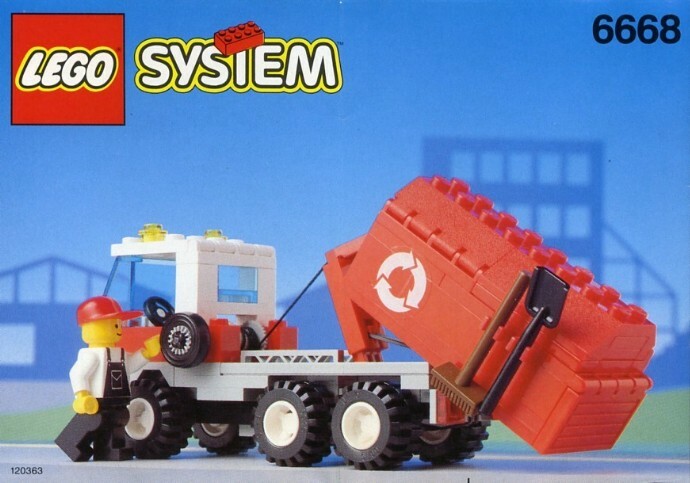 This neat looking ERF skip lorry, or ‘container truck’ if you’re from The LEGO Group, was discovered on Flickr. Built by Makorol it features full remote control drive and a host of other working functions. 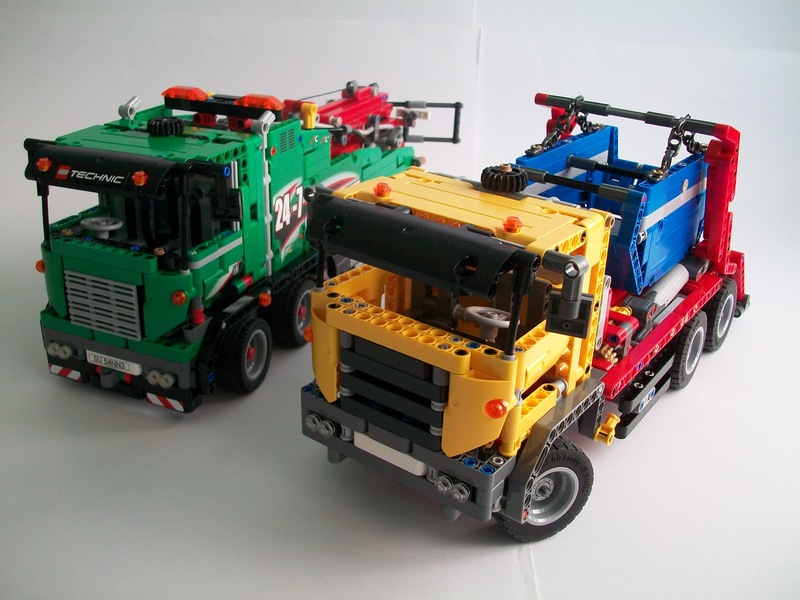 You can check out all the photos via Flickr here, watch Makorol explain all in his excellent video below, and you can read our review of LEGO’s own 42024 container tr… sorry skip lorry set by clicking here. After a leisurely hour or two you’ll have a skip lorry that looks quite nice, and your earlier fears over it’s colour co-ordination will prove unfounded. This is an attractive model. Although the feature count is quite modest, and nowhere near the let’s-stuff-everything-in 42008, what it does, it does well. Even the stabilizers do a good job… they are linked to a connector that engages with a bar on the skip when left up. This enables it to tip the container, which is something I’ve never seen a skip lorry do; perhaps I’m just not paying attention. It’s an effective, well thought out system. With the stabilizers down, two linear actuators move the skip in a graceful arc onto the surface behind, accompanied by much furious wheel twirling. As standard, this is a manual control model but said manual control is the usual black gear, when an old fashioned pulley and pin would be more ergonomic given the lowish gearing here. Or better still, stuff a motor in. It’ll take a PF M motor and battery box with the greatest of ease – so much so I suspect that it was intended to be motorized all along (hence the gearbox). The only reason it’s not being that it didn’t hit it’s price point so equipped. Allegedly. This would be a much better set at £80 with the motor included, but I can see why Lego wouldn’t want it troubling 42008’s market position. It does look good, and I think the colours help here, although it might be time for Lego to make a bit more effort in the cab area. There’s nothing bad here, but it’s a bit same-again. Detailing is a tad sketchy and ill-thought-out (if the doors had glass, the mirrors would go through it when they open, for instance). Presumably, it couldn’t be seen to out-shine the more expensive 42008. I prefer the grille treatment on 42024, though – those silvered grille tiles always look a little flat. Maybe I’m just pining for the 8292 Cherry Picker from a few years ago – an otherwise unremarkable set with a very attractive cab design. Or you can simply treat it as a blank canvas to put your own ideas on – it’s Lego after all! One piece (or rather six pieces) of very good news is the tyres – new for this set (and the digger in 42023), they’re proper square-shouldered, not-too-wide truck *ahem* lorry tyres that greatly enhance this model compared to the smaller, wider items on 42008. They enhance the B-model too – another grader! It looks pretty good though – at least as good as the 57,000 grader B-models that have preceded it… one of these days there’ll be a grader A model but I won’t hold my breath. You have to go online to build it, however, and that’s always a faff…. So, what have we learned? 42024 is quite stylish, in its multi-coloured, unadorned way, and it works quite well (if you add a proper handwheel) or very well if you put a motor in. 8/10 – if you’ve already got a motor. 6/10 if you haven’t. I’ve just realized that I’ve done an entire Technic vehicle review without moaning about the steering. This lorry has a good system. It really does. To see all the official LEGO sets reviewed by The Lego Car Blog, including 42008, visit the LEGO Set Review Library here.